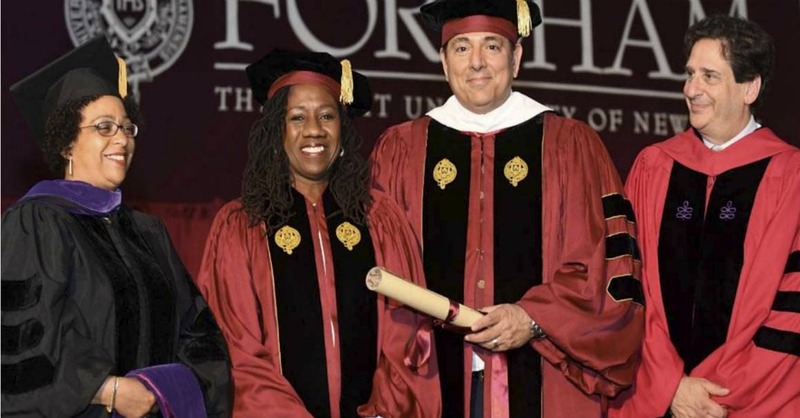 New York, NY – On Tuesday, May 22, 2018, Founding Partner Vincent R. Cappucci presented Sherrilyn Ifill, President and Director-Counsel of the NAACP Legal Defense and Educational Fund, Inc., with an honorary degree, honoris causa, at Fordham Law School’s 111th Law School Diploma Ceremony. The University conferred the degree on Ms. Ifill, commending her as one of our country’s leading voices on civil rights, having increased the visibility and engagement of the NAACP in cutting-edge and urgent issues, including policing reform, voter suppression and housing discrimination. Mr. Cappucci, who serves on the Fordham University Board of Trustees, congratulated the University for celebrating the achievements of Ms. Ifill and the continued recognition of Fordham Law School as one of the nation’s premier legal academic institutions. Mr. Cappucci is a graduate of Fordham Law School and has been actively involved in the advancement of the law school. Entwistle & Cappucci is a national law firm providing exceptional legal representation to clients globally in the most complex and challenging legal matters. Its practice encompasses all areas of litigation, including securities, antitrust, corporate transactions, general corporate and commercial, creditor’s rights and bankruptcy, corporate governance and fiduciary duty, government affairs, insurance, investigations and white collar defense. Clients of the Firm include public and private corporations, mutual funds, major hedge funds, public pension funds, governmental entities, leading institutional investors, domestic and foreign financial services companies, emerging business enterprises and individual entrepreneurs. Left to right: Gemma Solimene, Sherrilyn Ifill, Vincent R. Cappucci and Dean Matthew Diller.